Dense grass overshadowing the flowerbeds? Overgrown weeds crushing your beloved green lung? It is Nature’s order that fertile grounds would cultivate a variety of flora. With water, dirt, and sunshine, a green sprout is sure to spring up. Check our Worx GT2 review and see why you need this tool. This Worx GT2 review will show you this stools ups and downs. Good tools are needed to help maintain a beautiful garden. Depending on the size of your garden, even the most experienced green fingers can benefit with the help of reliable, user-friendly gardening tools. With the right device, overgrown lawn areas can be mowed, trimmed, and edged effortlessly. While there are plenty of grass trimmers and mowers available on the market today, it is worthwhile to opt for versatility and quality. If you are looking for a dependable garden appliance, take a leaf out of our article and find out how the Worx GT2 can help your garden flourish. With 7600 rotations per minute, we consider this mower capable of fulfilling most jobs. It takes around three hours to charge and holds up to one hour, we consider it’s battery life to be quite short. It’s lightweight and won’t wear your arm out like a traditional gas powered weed eater. The Worx GT2 is a 3-in-1 multi-purpose gardening device and can be used for mowing, trimming, and edging. With the Worx GT2, forget about having to operate and maintain multiple gadgets. Users can easily convert the Worx GT2 from ordinary mower to an effective in-line edger within seconds without any other additional tools. With a flexible gardening device such as the Worx GT2, you are sure to save energy, time, and money! Engineered with the user in mind, the Worx GT2 is easy to use for beginners and seasoned gardeners alike. Equipped with dual-position wheels for easy accessibility, the cordless Worx GT2 can be used on various lawn areas. Catered for users of different statures, a quick-release lever is installed to adjust heights accordingly. Just like a walk in the park, the Worx GT2 features a 90-degree tilting head and 12-inch cutting diameter that gets the job done with effortless maneuvers. The automatic 100% single line feed is another great feature of the Worx GT2. No bumping is required to extend the line. Therefore, instead of focusing on the length of the line, you can pay attention to where the grass ends and where your prized peonies begin. The Worx GT2 also has an adjustable safety guard, this helps protect against any accidental trimming of flowers or decorations in the area. 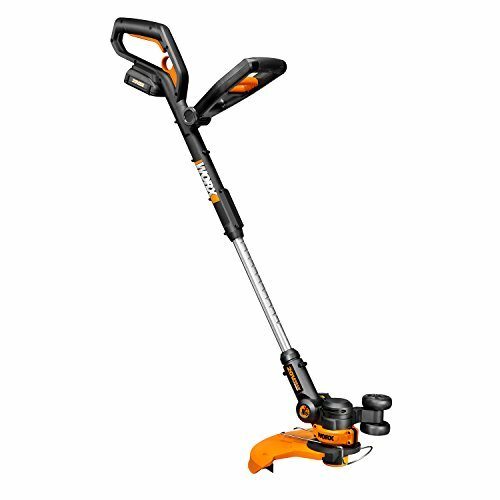 The Worx GT2 is a 3-in-1 durable gardening device that can be used for mowing, trimming, and edging. The lightweight device is cordless with adjustable heights for different statures. Equipped with a 90-degree tilting head, the Worx GT2 can be easily maneuvered. With a cutting length of 10” and cutting diameter of 12”, the Worx GT2 allows for wide coverage areas. Line diameter is at 0.065”, no load speed is at 7600 rpm. Automatic 100% single line feed with no bumping required. The Worx GT2 is battery-operated, using 32V rechargeable MaxLithium batteries. Battery charging time is 3 hours. The product dimensions are 12 x 12 x 35 inches and weigh at 6.2 pounds. Purchase of the Worx GT2 includes the trimmer, one 32V MaxLithium battery, battery charger, support wheels, safety guard and 3 trimmer spools. Extra spools are free, users pay for shipping and handling charges only. Do note that there are a 3-year limited warranty and a 30-day money back guarantees. Gone are the days of pushing heavy machinery around the lawn on a hot summer’s day! The Worx GT2 is lightweight but is able to thoroughly cut weeds and clear lawns. The automatic single feed line is a handy time-saver for all gardeners. With a majority of positive remarks for the Worx GT2, there are one or two complaints about the battery lifespan. However, this minor issue can be easily rectified with spare batteries. Overall, the Worx GT2 is an easy-to-use multipurpose grass trimmer that helps cultivate and maintain a blooming garden. Lawn owners, orchard keepers, house husbands, gardening enthusiasts, horticulturists are some potential owners of a Worx GT2. With the nifty Worx GT2. Minimize your time weeding, and maximize your time lounging in a neat backyard. If you reside in an apartment, flat, condominium or any other high-rise building, this product is not for you. However, you can choose to gift one to your ground-dwelling, lawn-owning friends, and family. What Is The Expected Battery Life On A Single Charge? It is dependent on how long you have used the battery for. Do note that you will have to charge the battery for first-time use. Is A Battery Charger Included In The Purchase? Yes, purchase of the Worx GT2 includes a battery charger and one 32V MaxLithium rechargeable battery. It is recommended to purchase extra rechargeable batteries. Are The Extra Spools Free, As Advertised? Yes, the extra spools are free for as long as you own the trimmer. You only have to pay for shipping and handling costs. Is There A Warranty For The Worx GT2? Yes, there is a limited 3-year warranty. The Worx GT2 is a versatile grass trimmer that provides multiple functions to keep your backyard spick and span. It is lightweight, easy to handle, and comes with an automatic single feed line for edging. Purchase of the Worx GT2 mini-mower includes free spools for life and a limited 3-year warranty. I hope you liked our Worx GT2 review and found it useful.